[deleted post]I do not agree with your pixel things. I don't wanna go technical here. Just put your htc hd2 & iphone4 on the table. You will see very clearly …..which got better screen. Of course denser pixel on screen is better and also visible to eyes….at least for my eyes lol. Same thing with BB phones……they got small screen but high resolutions….so they are far better & eye pleasing than those of nokia E70's models. For you info, I like HTC but when comes to camera & display quality, they are way behind Samsung. Super Amoled Plus is one hell of display technology which Samsung has monopoly at this moment. They are better in Camera & CPU department as well. Samsung is huge co which makes almost everything in electronic world. So they've edge over other cos……But in softeware & quality-hardware(minus display) Htc shines. Ideally though I'd like to see 32Gb storage, and a 2000Mah battery, a higher res screen would be ideal, but since it has a way higher resolution for its size then a desktop display already I guess it will do fine. The storage at least should be trivial to fix since I expect it has a SD card inside only alterable by the manufacturer. But since I'm in the market for a new phone this looks to me to be the winner since I want a big screen and fancy trying windows 7, unless something better comes out between now and Oct/Nov ish. To people that think this phone is to big to hold. I have compared it to the HTC HD2 which I have. I can slip the HD2 in and out of my jeans front pocket wile I am sitting. And because it is so thin you don’t even feel it when it is there. Making it 3.7mm wider and 1.1mm thinner will not make the titan unmanageable. Common guys and gals stop nit picking at the trivial things. What I’m concerned about is how long it is going to take the WP OS to be a “jack of all trades” like the WM OS was. “Eye candy and easy of use” is a good thing, but I should not have to sacrifice “features and functionality” to get it. And at the rate the iOS and Android OS are improving the WP OS should not be taking there cool time to bring out notable improvements. So when you restrict functionality that I can get in any of those other devices which will force me to carry a next device as well, then I say the OS or the hardware is not very smart (depending on how much is missing). And in this case I have to blame the OS, not the Hardware. maximun 4.5 screen size can be consider for mobile phone, 4.7 is too big. Atijny, 11 Sep 2011Pls more about Mango. Does it accept bluetooth file transper? 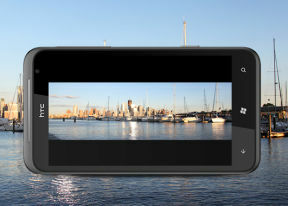 WP7 in my opinion is still Microsoft version of the iOS in its early days. So forget about getting files on your phone that do not pass through the Zune software or email. (mango) didn't fix that deep in the OS. Pls more about Mango. Does it accept bluetooth file transper? all, 11 Sep 2011Can htc titn worck with android? No, it has nothing to do with Android. all, 11 Sep 2011Can htc titn worck with android? No, this phone has nothing to do with Android. Can htc titn worck with android? Anonymous, 10 Sep 2011yeah, his right, lets post something informative and productive here, we are not here because ... moreTrue and who cares if itn't not amoled, dual core, 1 gig of ram, bla bla. It's still an awesome phone with cool OS that work perfectly smooth and responsive on it. I don't care about it's hardware, if it runs great on Titan, that's all I care about. I like this phone more and more with each day. Btw I noticed something interesting about the camera when watching one of the videos about the Titan. First it has that great option when you can acess the camera even if phone is locked just by pressing the shutter key. But the most "juicy" thing is how fast the camera is. Entering the app was instant just like scrolling from one homescreen to another and it was the same when taking a photo. [deleted post]Be as angry as you want but he is right. All you are doing is going on and on about an Android Phone in a Windows Phone forum. You think when people clicked this like it was because they wanted info and opinions about Samsung and Android? Or was it for opinions of the Titan and by extension the WP7 OS? The people that want to read and post opinions about the “Samsung Galaxy Note” normally go to…. They are not coming in the HTC Titan forum because of how great the “Samsung Galaxy Note” is, so just give it up already. If you must criticize, do some research and come with some details. Not just say “BS” over and over again. and don't hide behind "Anonymous" when everyone can still see your I.D. "stSP"
AnonD-20790, 09 Sep 2011the os is windows phone 7 mango is it different than the windows phone 7.5 mango or the same a... moreIt’s "Windows Phone" OS the version code name is "Mango". Don’t let the numbers confuse you. Anonymous, 08 Sep 201116gb without memorycard slot? C'mon HTC. U people know a lot of people are weary of this platf... moreTry to read other post before you make a comment. And the reason for no card slot in a WP7 OS phone has also been given before as well. No card slot does not mean it does not have a SD card internally. So why are you just repeating without adding anything new, are you and echo? Total of 410 user reviews and opinions for HTC Titan.